Rendering courtesy of ODA Architecture. The lottery (pdf) for 183 apartments at 54 Noll Street and 123 Melrose Street, known as Evergreen Gardens, launched today for one of the parcels of land being redeveloped on the site of the former Rheingold Brewery site in Bushwick. Individuals and families earning 60 percent of the area median income, or between $34,355 and $57,240, are eligible to apply for units ranging from $947/month studios to $1,230 two-bedrooms. Among its plethora of indoor and outdoor amenities, the massive ODA-designed project boasts a central park and a rooftop terrace complete with an urban farm. 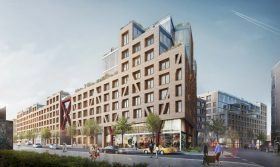 Slated to be the largest influx of housing created in Bushwick ever, ODA Architect’s two projects on the old Rheingold Brewery site continue to progress. Rabsky Group’s 10 Montieth Street, a nearly 400,000-square-foot, seven-story building with 392 units, just topped out. And All Year Management’s impressive development, totaling one million square feet, at 123 Melrose Street is currently being clad. Overall, the two projects will span three full city blocks. 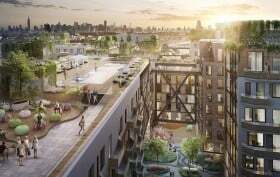 In March of 2015, the cube-happy architects at ODA revealed their design for 10 Montieth Street, part of Bushwick‘s 10-block Bushwick’s Rheingold Brewery site. The 400,000-square-foot, 400-unit rental building from the Rabsky Group has a bow-tie shape with a sloping zig-zagging green roof and amenity-laden courtyard. Last week, renderings were released for a second project from ODA at the Rheingold site, this one with developer All Year Management. Inspired by a “European Village” and dubbed Bushwick II, this rental one ups 10 Montieth; it will encompass one million square feet over two city blocks and have 800-900 units, as well as an entire system of interconnecting courtyards and common spaces that break from the street grid, an 18,000-square-foot central park, and a 60,000-square-foot rooftop with an urban farm and recreational spaces including a pool. Dezeen has uncovered additional renderings of Bushwick II that showcase these outdoor spaces, and they do not disappoint.